Dear Editor, I have been observing the actions of the Guyana National Broadcasting Authority (GNBA) in recent months and am being led to believe that the body, set up as a bipartisan entity to ensure broadcasters comply with the Broadcasting Act, Number 17 of 2011, has been politically contaminated and has now been given a mandate to go after broadcasters, who are not pushing the government’s propaganda and those who are reporting information coming out of the political opposition. Dear Editor, The Forestry Commission has been by far, one of the most progressive State agencies, and one that has attracted continuous donor support over the last two decades. Dear Editor, We, the undersigned, note with concern the circulation of videos on the social networking site, Facebook, which shows a social media personality recording himself walking up to strangers in public places and holding their hands. Dear Editor, Much has been said over the past few weeks on the GFC restructuring and the dark cloud that staff have been placed under with this exercise. Dear Editor, The government-owned and controlled Guyana Chronicle recently carried a story announcing the grant of $6.5 million to 130 Rupununi youths involved in the APNU+AFC sponsored Hinterland Employment Youth Service (HEYS) Programme. 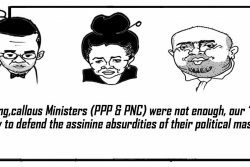 Dear Editor, In his letter `Chris Ram should be one of the leaders of a new government, President Granger has been a disappointment and Ali is loaded with negatives’ (SN, 25th April 2019), Mr Emile Mervin makes some interestingly good points. Competence and academic qualifications are not one and the same. There are many competent people who have no formal certificates, just as there are those who if anything are over-certified, but are nevertheless quite incompetent in their field. Dear Editor, Safe and loving families are important for the development of communities and our wider society. Dear Editor, The ‘send a child to school initiative,’ is one which sought to equip school-aged children (nursery – secondary) with essential classroom items, with the aim of allowing our children an equal opportunity to the right to education/to be educated, as we believe “no child should be left behind, disregarded or disadvantaged,” as a result of a lack of anything. Dear Editor, Just a few notes on the Vice Chancellor’s letter in the April 24th issue of Stabroek News enumerating his achievements. 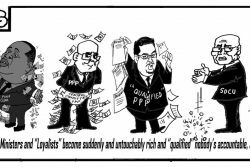 Dear Editor, As the dust from the Ministers’ conflict of interest contracts continues to swirl over and around us there have been a number of suggestions on the way forward. Dear Editor, A comedian Volodymyr Zelensky, with very little experience in politics, won the presidential elections by a landslide in the Ukraine. Dear Editor, Professor Ivelaw Griffith is a Guyanese national treasure. We should pickle him and preserve him at UG for a long time. 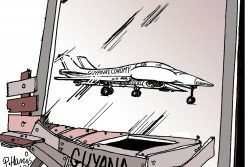 Dear Editor, As a Guyanese who closely followed Guyana’s politics for over 40 years, I have to say without reservation that Guyana is ideally poised for truly great and visionary leadership. 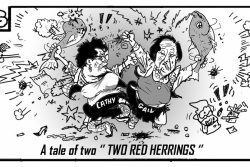 Dear Editor, Though the two ministers passed the non-participation conflict of interest test, the legislation needs to be tightened. Dear Editor, I would like to respond to assertions attributed to Minister David Patterson, on the subject of the Cheddi Jagan International Airport Expansion Project, which seem to have found their way out of his Facebook Page into reporting in at least two national dailies. Dear Editor, I refer to the article headlined, “No local accreditation records for school Irfaan Ali used for admission to Indian University” (SN: 23/04/19). Dear Editor, For some time now, I have been silent as misinformation, outright fabrications, and innuendo have been published as journalism products and facilitated as letters to the editor. Why is the Local Gov’t Commission not implementing the City Hall CoI recommendations? Dear Editor, In spite of the resolution of the imbroglio that had confronted the Local Government Commission (LGC) a few months ago, with regard to the approval of its 2019 work programme and the release of funds for the payment of its expenses, including the salaries and emoluments for its staff and commissioners, which I might add, are not insignificant, the LGC seems to be still paralyzed, as many months are going by and yet one cannot hear anything out of them, particularly as it relates to the implementation of the recommendations of the Commission of Inquiry into the operations of the Georgetown City Council, which was delivered to them almost half a year ago. Dear Editor, The writer of the letter headlined, ‘Bribe-seeking cops preying on farmers using De Hoop branch road’ (SN: 23/04/19), on the one hand states he will not condone breaking of the law, while on the other, apparently sees nothing wrong with “a farmer, who may be unlicensed, driving home who may have taken a drink.” Wrong is wrong and cannot be right. Dear Editor, I am extremely disappointed by this letter by the former president `The Constitution must be adhered to, not reformed’ in yesterday’s Stabroek News. Dear Editor, Can former President Donald Ramotar (‘The Constitution must be adhered to, not reformed’ SN: 22/04/2019) please tell me why he expects half of the population of any country to adhere to any constitutional rule that they consider detrimental to their interest? Dear Editor, It is with grave concern that I have decided to write this letter. Dear Editor, I am deeply saddened having received the news about the death of Sir Alister McIntyre. Dear Editor, Cricket was known as a gentleman’s game, but with the advent of 20/20 matches and the hundreds of millions of dollars being paid out by sponsors and the big bucks earned by the players, it seems to me that it is more business rather than a sport. 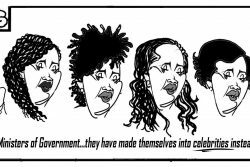 Dear Editor, I have learnt that Minister of Public Telecommunications, Catherine Hughes has indicated her intentions to take legal actions against the Stabroek News, Anand Goolsarran and Gail Teixeira for public comments they made about an apparent conflict of interest, where her company, Videomega Production received at least one contract from the government of which she is a serving minister. Why was GAWU silent when the PPP was ruining the sugar industry? Dear Editor, About three weeks ago, Stabroek News published a letter (SN: 29/03/19) by the General Secretary of GAWU, Seepaul Narine in which he criticised my positions on the sugar industry and expressed his opinion that I took no position on the dismissal of 7,000 sugar workers and claimed that I was trying to be relevant, when, I really was not, in the current political climate. Dear Editor, Having read the article, ‘Agro processors want more robust lobby for access to regional markets, local outlets’ (SN: 19/04/2019), I looked at the accompanying picture of the displayed products and noticed some improvements in bottling and packaging. 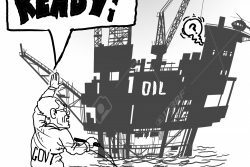 Dear Editor, ExxonMobil’s announcement Thursday that it made a new and its 13th oil discovery offshore Guyana at the Yellowtail-1 well included another bit of information worthy of some attention. 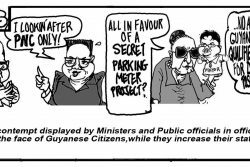 Dear Editor, The Guyanese society is one laden with latent potential. However, about fifty percent of this untapped resource is a particular group that is often overlooked, neglected and underestimated, even in this day in age. Dear Editor, The Stabroek News of Thursday, April 18th, reported on the conviction of Daniel France for trafficking of 25 grammes of cannabis. Dear Editor, Almost all the political commentators who dominate our press today, speak of the need for constitutional reform(s). Dear Editor, It has been more than a month since the EPA visited a Cotton Field, Essequibo Coast businessman regarding my complaint of dust and noise pollution. Dear Editor, A columnist recently expressed concern about persons in authority and requested that I do an evaluation of their fitness. Dear Editor, Thank you for publishing my letter, which you chose to title “The oil and gas loans will help in Guyana’s development.” (SN: 21/04/19) I am not sure if you edited the letter as I haven’t read the published version carefully. Dear Editor, Cases of conflict of interest have flared up in the public domain again. Dear Editor, I was looking at Al Jazeera News and listened to the serious situation in the world today. Dear Editor, The plight of sugar workers in Guyana could have been avoided. Dear Editor, The type of banditry perpetrated on the family of the football coach has now become systemic in this country.